In 1984, Msgr. (later Bishop) Severino Pelayo, (U) the parish priest of St. Andrew the Apostle, organized a Parish Pastoral Council (PPC) ‘ and a Parish Finance Council (PFC), in compliance with the 1979 directive of the Synod of Manila. Four Ministries evolved as a result of the organization, namely Worship, Education, Social Services, and Youth known as WESY. Through the WESY, a new concept of ministry organization was initiated by Msgr. Pelayo. The Education Ministry whose officers and members came from the Villages of San Miguel, Bel-Air, Rizal and Santiago focused on Formation and Conversion. In its initial stage, lack of Christian Community life had been the driving force of EDM (Education Ministry) to center its activities on community building. Scripture Study, Bibliarasal and Catechism for children were the early activities of the Ministry. Later the Parish Renewal Experience (PREX) and Basic Ecclesial Community (BEC) were introduced and formed. In the succeeding year, (February - October 1986) Bishop Leoncio Lat (U) emphasizing the foundations of our faith, organized a once-a-week catechetical training for children and spiritual conversions for adults. When Fr. Chito Bernardo (now Msgr. Chito) came (November 1986 -May 1991) PREX (a modification of PRE) went into full swing. The Weekends yielded bountiful harvests. Organizing church activities and building up of human resources through training and seminars became the priorities of the ministry. A Home Visitation Program was organized and Family-based Masses were held in the Villages to bring Christ to the households in the community. Teachings on the meaning and importance of the Holy Eucharist were given before celebrating the street masses. Bibliarasal groups bloomed. During the time of Msgr. Francis de Leon (now Bishop) from 1991 -1993, various programs were launched: ENNEAgram, catechetical training programs for children, adults and househelps were conducted. With the guidance of Fr. (now Msgr.) Claro “Matt” Garcia in June 1993 to March 2002, the Parish Vision and Mission Statements were formulated which gave direction to the parish. The Parish Constitution and By-Laws was penned by Dr. Pete Villanueva, the PPC President then (and a former EDM Chair). Catechesis on the teachings of Vatican II, PCP II, and PCM II were given. The Parish Pastoral Council for Responsible Voting (PPCRV) and an Election Awareness Board were set up to enlighten parishioners on elections. 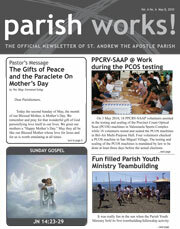 As the Spirit continues to move in the church, parish community life pulsated even more with the coming of Msgr. Manny Sunga (April 2002 till the present). The Education Ministry has been continuously facilitating seminars on Value formation, pastoral formation, skills training and renewal programs, i.e. Organizations and Structures of the Parish / Roles and Responsibilities of Pastoral Workers in Church building / Parish Vision and Mission; Discipleship; Christian Leadership; Stewardship; Facilitators Training and Bible Study. PREX has been re-introduced and Weekly Holy Hour is being held. Street Masses in sub-parishes became more vibrant. The ministry sponsors the Yearly PPC Planning Conference. Now that faith is so alive, the Ministry strives for enrichment. The Programs / Projects / Activities are aligned to the Archdiocesan Vision -Fullness of Life and to the proposed Mission rooted on the Pondo ng Pinoy’s “Theology of the Crumbs.” The goal is total development of man, liberated from all forms of enslavements and upliftment of his dignity. The Education Ministry envisions now and here an enlightened community on the gospel values and on the teachings of the church so as to be living witnesses to the life of Christ and be another Christ to the community.